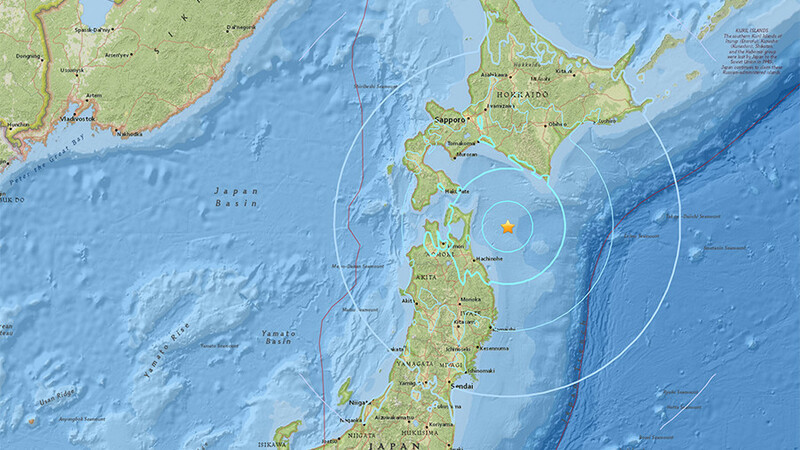 A magnitude 6.3 earthquake has struck off Hokkaido, Japan Wednesday at a depth of 64km (40 miles). There are no immediate reports of injuries or damage. The quake occurred at approximately 19:51 local time Wednesday, 103km northeast of the island of Honshu, Reuters reports. No tsunami warning has been issued, reports NHK. The quake lasted approximately 30 seconds but didn't cause any damage on land. Japan has been on high alert ever since the magnitude 9.0 Tohoku earthquake on March 11, 2011 with an epicenter near Honshu. The quake generated a tsunami which resulted in one of the worst nuclear disasters in modern history at the Fukushima Daiichi plant. The quake comes just 24 hours after a 7.9 quake struck offshore Alaska, triggering a tsunami warning along the western seaboard of the US and Canada for a time, and launching a tsunami advisory as far away as Hawaii. There was also a magnitude 6.0 earthquake off the coast of Java in Indonesia on January 23, though only minor damage and injuries were reported.